Image credit: Paula Dawson, 2013. Production still for digital holographic print, created using Holoshop haptic interface. 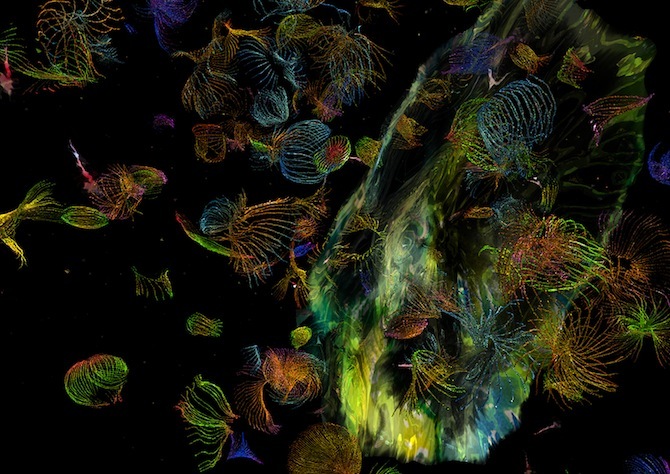 This exhibition showcases collaborative holographic and stereoscopic video artworks developed by Associate Professor Paula Dawson in collaboration with the Holoshop research team. Envisaged as an interactive holographic laboratory, it demonstrates the interactive Holoshop tactile interface and its creative potential as a tool for holographic and new media artists. Alongside an interactive Holoshop tactile interface are new holographic artworks, including computer-generated laser holograms (CGH), digital holographic prints and stereoscopic animations created by Paula Dawson. While demonstrating the technical achievements of Holoshop research, Holoshop: Drawing and Perceiving in Depth also reflects Paula Dawson’s exploration of the effects of spatial and temporal imagery on human consciousness and perception. Associate Professor Paula Dawson teaches at the College of Fine Arts, UNSW. She has pioneered large volume optical hologram recording and the investigation of spatial and temporal effects of pictorial agents in optical, digital and computer generated hologram imagery. Paula leads the project, ensuring that the group’s activities are wholly integrated, designing the virtual drawing tools, and undertaking experiments in drawing sequences through the practical use of the Holoshop software and the haptic interface, the Phantom. Paula creates the scene files and supervises their testing across computer generated hologram (CGH), digital hologram, holo-video, stereo and related 3D display systems.